Find out more about the NACBS Annual Meeting here. 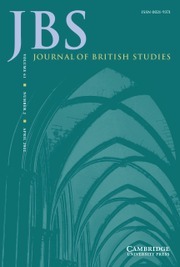 Journal of British Studies (JBS), the official publication of the North American Conference on British Studies, is the critical resource for scholars of British culture from the Middle Ages to the present. JBS presents peer-reviewed scholarly articles and book reviews from renowned international authors, who use both established and emerging approaches to present their ideas on British society, politics, law, literature, art, history, economics, and sociology.